Cinema screen grab taken from a French documentary series Dutch mini series "Apocalypse, la Première Guerre mondiale" (Apocalypse, World War I) made in 2014 where cars are being investigated by IMCDB. Taken from 500 hours of cinematographic archives, often unpublished and colored. -- This French car was made in Gennevilliers, Paris by a company started 1899. By 1910 they were fifth largest, including taxis. This is cca 1907 Chenard & Walcker 'O' Fiacre de Paris. Fascinating photo received from Laurie Waite (UK) doing research on his village, Compton Basset in Wiltshire, and on an unknown car belonging to the Walker-Heneage family of Compton Bassett House, who owned the whole village until 1918. Photo probably taken 1910. -- Quite a unique car made a company that is still around today making commercial vehicles. This is cca 1907 Dennis Roi des Belges Canopy, poss 35HP. Reg AA 987 is Southampton but may be a transferred plate. Photo received from Gerald Davis, Atlanta, Georgia (USA) saying 'here is photo of another relative in a vintage car requesting to be identified. 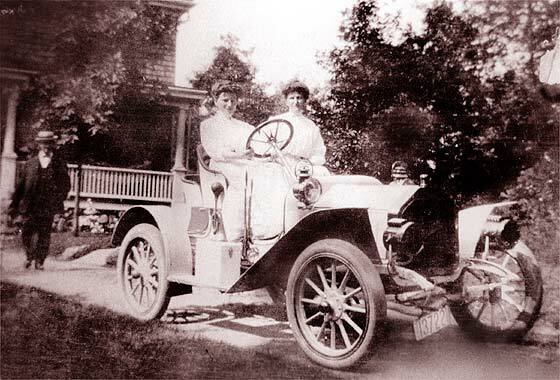 The photo is of Helen W Cutting and Mary Eva Warren testing out their older brother Percy Warren's first automobile in Weston, Mass, early 1900s. -- Just visible trace of a logo on the radiator. Car made in Detroit by oldest automobile company in USA which became part of General Motors. This is cca 1908 Buick Model 10 Runabout, made 1907 to 1910. One of three faded photos received from Peter Collins (UK) saying he attended a talk on vintage photographs where it was suggested that SVVS could help in identifying cars. The photos are part of family history and would date from the early 1900's. This one was taken in England but no clues so help with make/age would be appreciated. 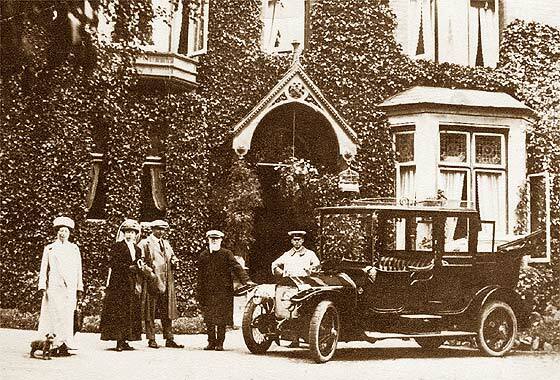 -- We have repaired and enhanced the photo which is of a relatively large luxury car being a cca 1910 Wolseley Siddley Landaulette, poss. 30'34. 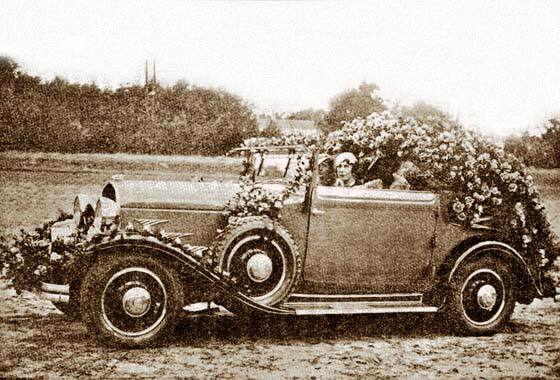 Another photo received from Gerald Davis, Atlanta, Georgia (USA) saying 'of a vehicle belonging to my ancestors. 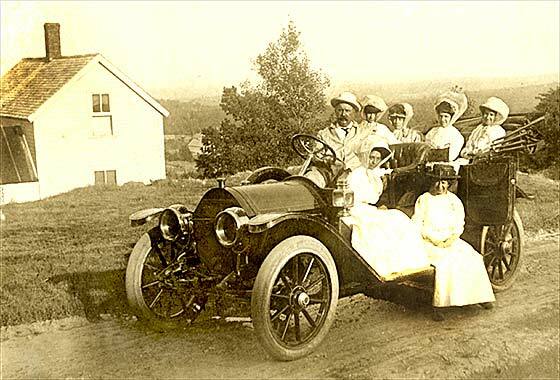 This one shows Weston Police Chief Patrick J McAuliffe driving a group of ladies (including my ancestors) to a birthday gathering at Mt. Wachusetts. Can you identify the vehicle?' -- Big expensive car manufactured by company started by Henry Ford in 1902 and after he left, named after founder of Detroit. No front door so cca 1911 Cadillac Model 30 Tourer, 4.7L four-cylinder. Intriguing photo received from Anton van Luijk (Holland) saying he got it through a friend. The girl in the back of the car was around 4 years old when the picture was taken, she turned 100 last year. He would like to know which car make this is. Hope one of our readers can identify it. -- Regretfully the photo is slightly distorted and is of poor quality, and we thought 'unknown' or perhaps a FIAT Tipo Zero. 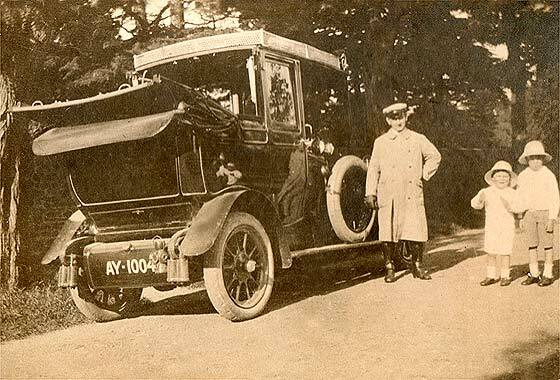 However, our Ariejan Bos contacted to advise it a cca 1912 Benz 8'20 Limousine Landaulette. Photo received from Colin Lyle (UK) of the Lyle family (Tate & Lyle) from Philip Lyle's travels in the very early days of motoring in 1912 from UK to the Balkans via Germany, Austria, Bosnia, Hercegovina, Dalmatia, and up the coast to Austra and then Holland. -- This was one of many trips he had made since the turn of the century in various vehicles including a Stanley and a White Steamer. 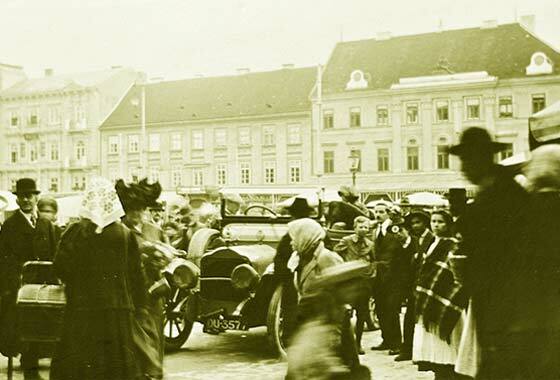 This photo was taken in Agram Croatia, now Zagreb, and is a cca 1912 White 20HP GA, Petrol. Photo received from Roger Weaver Elkhart, In. 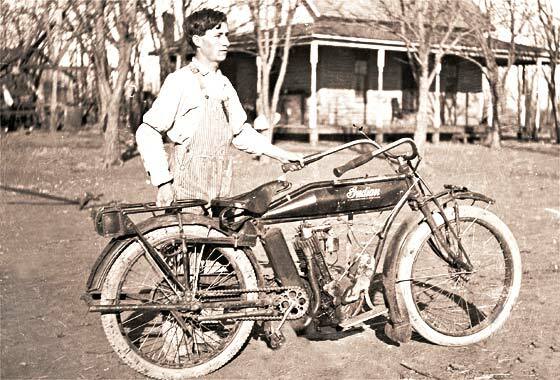 (USA) asking if we can help identify year and model; his grandfather with his brother's Indian on family farm, south of Protection, Kansas, sometime 1911-1917. Grew up Amish in Ohio and moved to Kansas in 1909.-- Our motorcycle expert Chas Moody is pretty certain it is a 'Cradle Spring Frame' cca 1913 Model E Indian of 4hp with 30cu.in. (492cc) single cylinder engine. Indian bikes were then technically far in advance of most other makes. Another fascinating photograph from our regular contributor Cicos Florin in Constanta by the Black Sea (Romania) who is interested in old cars of Romania. Do we know what the cars are in the second photo showing parked cars; far right . 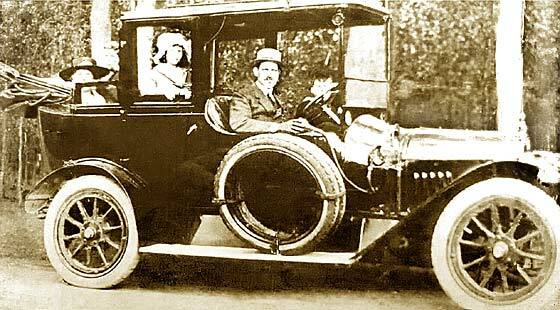 -- The first car is a cca 1913 Hotchkiss AD Phaeton-Landaulette where both parts of the rear roof fold down. The far right car is at the moment a bit of a mystery. It is big and smart and looks Italian but with a Tulip Bodied Phaeton coachwork. Not FIAT? Another fascinating photograph from our regular contributor Cicos Florin in Constanta by the Black Sea (Romania) who is interested in old cars of Romania. Do we know what the cars are in the second photo showing parked cars; right . 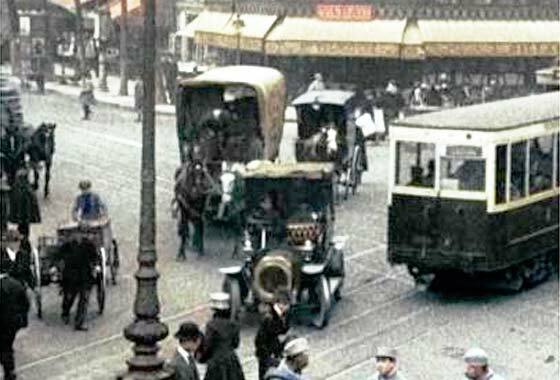 -- The first two cars in line on the left; left one is probably the bigger cca 1913 FIAT Tipo 2F Lorry whereas the second one along is a saloon car and probably the cca 1912 Fiat Tippo Zero Landaulette, curved-to-flat bulkhead, open driver's compartment. Another fascinating photograph from our regular contributor Cicos Florin in Constanta by the Black Sea (Romania) who is interested in old cars of Romania. Do we know what the cars are in the second photo showing parked cars; centre. -- The photo is not really clear enough to ID the dark vehicle in the centre which carries a sign which reads 'Reserva G de Aviate'. Frosted glass windows so ambulance or staff HQ. Behind this seems to be a big FIAT with sidecurtains and windscreen. Another fascinating photograph from our regular contributor Cicos Florin in Constanta by the Black Sea (Romania) who is interested in old cars of Romania. Do we know what the cars are in the second photo showing parked cars; right. -- The shape of the humpy radiator and bonnet of the first two cars left suggest a French car manufacturer from Paris, although these seem commercials so would be of the bigger cca 1913 Brasier 16 HP. The right vehicle is another cca 1913 FIAT 2B. Another fascinating photograph from our regular contributor Cicos Florin in Constanta by the Black Sea (Romania) who is interested in old cars of Romania. Do we know what the cars are in the workshop; far left. 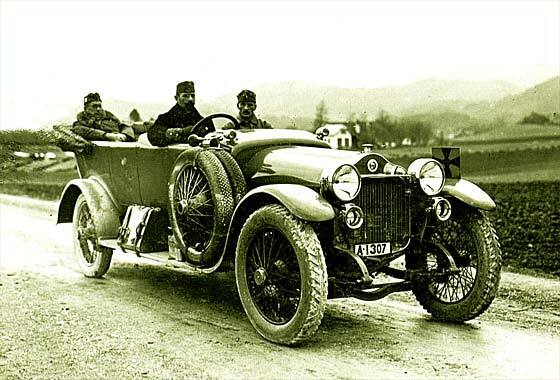 -- Far left, the shape of the radiator and badge suggest an Italian cca 1913 FIAT Tipo 2B. 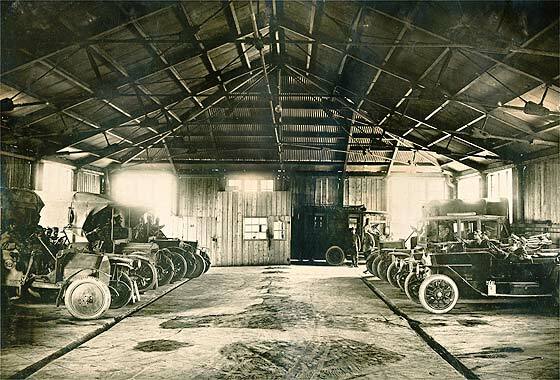 Adjacent on the right, the shape of round radiator and bonnet suggest a French Car made by Paris munitions manufacturer, sharp edges to rad, cca 1913 Hotchkiss AD Decapotable. Another fascinating photograph from our regular contributor Cicos Florin in Constanta by the Black Sea (Romania) who is interested in old cars of Romania. Do we know what the cars are in the workshop; far left. -- The shape of the round radiator and bonnet suggest a French Car made by a munitions manufacturer in Paris; who also had a plant in England. Sharp edges to the rad, curved scuttle, flat mudguards and gas lamps say pre-WW1. This is a cca 1913 Hothkiss AD Decapotable. Another fascinating photograph from our regular contributor Cicos Florin in Constanta by the Black Sea (Romania) who is interested in old cars of Romania. Do we know what the cars are in the workshop; middle. -- The shape of the radiator and badge suggest an Italian car made in Turin. Badge is of the type that was current 1904-1921. Bulkhead is a plain slab, dumbirons droop. Looks more like a small commercial than car, so probably cca 1913 FIAT Tipo 2B 15'20 Chassis. Another fascinating photograph from our regular contributor Cicos Florin in Constanta by the Black Sea (Romania) who is interested in old cars of Romania. Do we know what the cars are in the workshop; right. -- Looking carefully at the photo, there are three bare chassis being worked on. The one on the left is having the engine looked at. 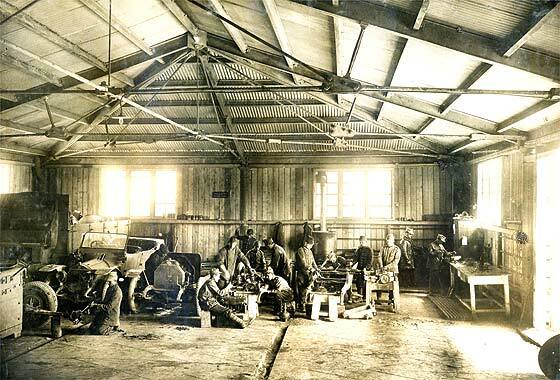 The shape of the chassis dumbirons is very similar to the small commercial being overhauled on the left, probably cca 1913 FIAT 15'20 2B Chassis. Surfing through the internet in attempting to identify old vehicles we came across a Wikipedia Website Page called Unidentified Automobiles showing very interesting ancient machinery for which they are asking identification. 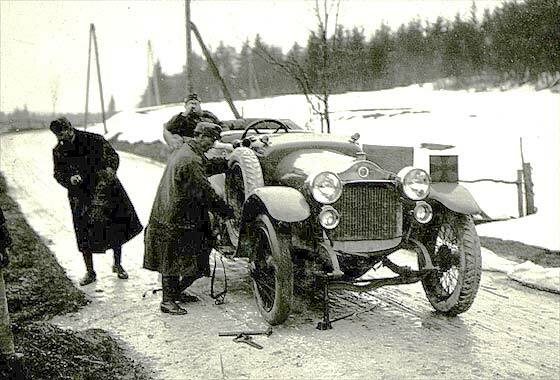 -- Photo notated 'Fahrt zur Front, Panne (10-4-1917)'. Another photo on HP106, but no numberplate. Belgian manufacture, big car, the radiator is flat but fronts of mudguards rounded so likely cca 1914 Minerva Torpedo, probably 38CV Knight, with punctured tyre. 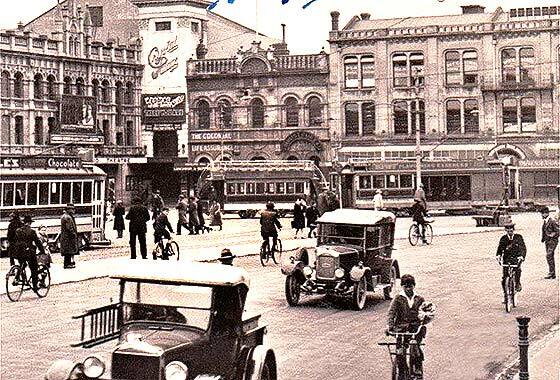 Link passed to us by Mark Dawber (New Zealand) to a photo of Cathedral Square, Christchurch, showing a car he is trying to identify. Is it a British Swift, Calthorpe or Clyno? The car in foreground is a 1929 Ford Model T Pickup. -- Indeed British but none of the above. Made by a bicycle-turned-motorcycle maker in Coventry who from 1901 also made cars and commercials. Sales by William Rootes, later Rootes Group, who took them over in 1956. This car is a cca 1925 Singer 10'26 Tourer. 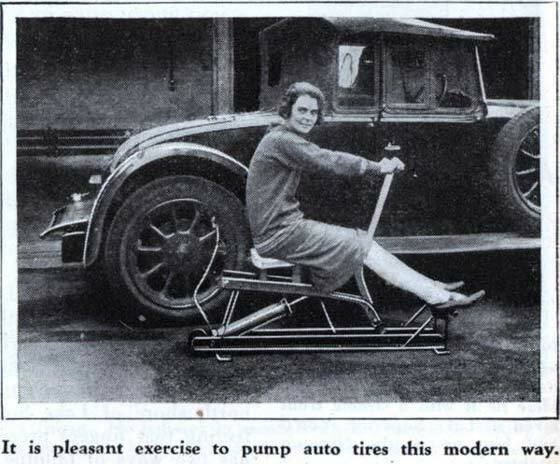 Photo posted on AACA website by Dosmo (USA) saying any help would be appreciated in identifying the vehicle shown behind unusual exercise pump. -- The pumping device is a British invention by a rowing enthusiast and is called the Situflator. The seat slides like on a racing boat allowing a long strong pull on the pump handle. Apparently good for leg and back muscles, not fatiguing to use. Needs lots of punctures? The car is also British, being a cca 1927 Talbot 14'45 Drophead Coupe. Photo received from Len Greyling (Australia) in 2007. Our Chas Moody advised that 'Triumph' was on the engine. 'Flat tank' model, pre-1929. Front forks with the centre spring were typical of 1927 models. Four stroke side valve, probably 500cc, so, a cca 1927 Triumph 500. Photo is later.-- Just had message from Sander Izaks, VMC Netherlands saying it is a 1928 Triumph Model NP. It was similar to 1927 Model N with grey petrol tank. NP was catalogued only for 1928 and had a black reservoir. 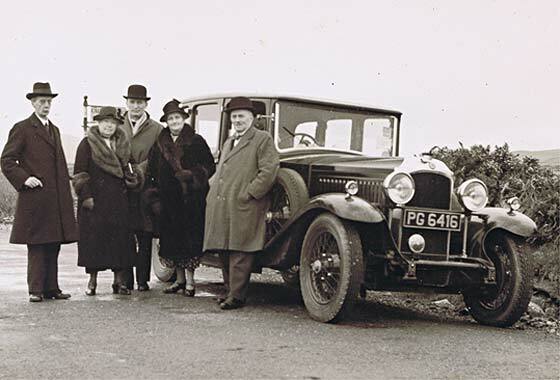 Lovely photo received from Ray Brennan of Lusk (Eire) saying he was wondering if this Surrey registered car belonging to an old family friend could be identified? Picture was taken in Co. Wicklow, Ireland in 1934 or 1938. -- Indeed registered at Surrey County Council in early 1930. Car is named after Vauxhall Iron Works in south London but later made in Luton and became part of General Motors. 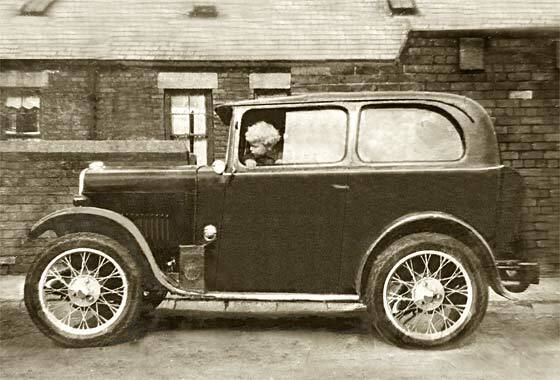 This is a cca 1930 Vauxhall 20'60 Saloon, probably Grosvenor bodied who became part of Vauxhall. Photograph posted on the PreWarCar website by Laurens asking if anybody can identify the car in the photo taken in Heideweek in Ede in the Netherlands. Heideweek celebrates the blossoming of the flowers on the Ede heath and now includes a music festival. -- Car is American founded in 1925 when the ailing Maxwell-Chalmers company was reorganized into the Chrysler Corporation. This is cca 1930 Chrysler Series 77 Roadster similar to the car that finished fifth in Spa Belgium. 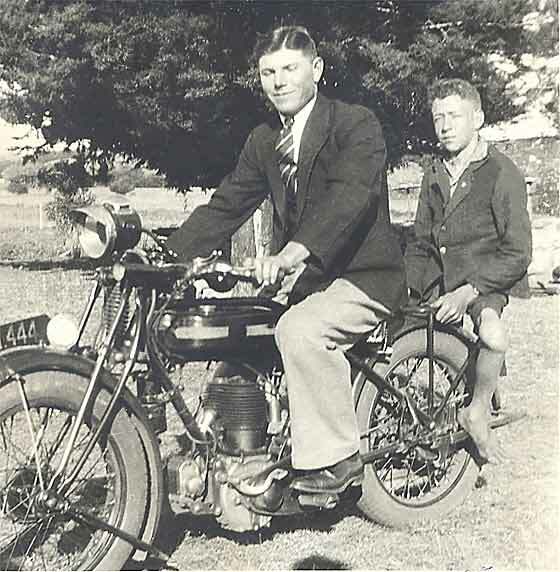 Rather damaged photo received from Dave Law (UK) of his father-in-law in his father's car in 1935'6. He has carried it in his wallet for about 60 years and has never known what the car was. Dave has had a go at removing some of the creases, blemishes etc to make it a better image. -- Headlamps not on wings, wire wheels and fitted with air vent on the scuttle, this is a cca 1930 Triumph Super Seven Saloon costing £150. 17,000 made between 1927and 1934, to compete with Austin 7. Puzzling photo received from Julie Marriot (UK) researching family history and has this wonderful photo of her great grandfather as chauffeur for English aristocracy between 1900 and 192, initially a groom in London, later on country estates. Is it a Napier Landaulette? -- Landaulette definitely but our gurus not sure if Napier. 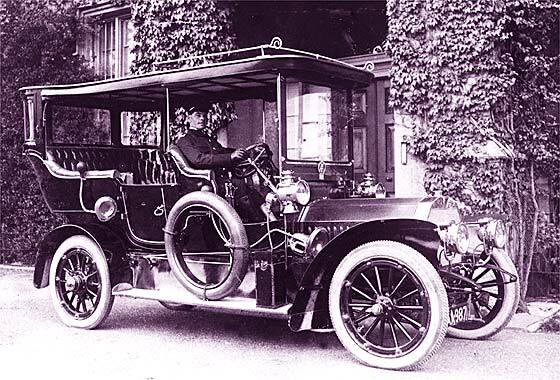 Bodies were made by external coachwork companies and the same, or similar bodies, would have been fitted on a number of different makes of cars. Puzzling photo received from John Costello (UK) saying he has been advised to contact us by the Vintage Taxi Society. He has a radiator grill that he is trying to identify. 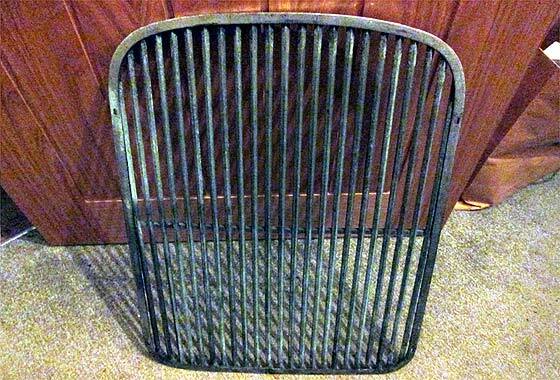 Having restored an old truck, he knows only to well the problem of spares but my grill can't be of use to anyone unless it can be identified. He hopes we can help. It measures 16.5" x 22.5" and is flat.? -- It seems to be a very simple shape. Four small elongated mounting holes in the rim. Somebody will surely recognise it!